Hello, I’m Alan Hunt, Director of Church Partnerships & Advocacy with World Orphans. My efforts focus on bringing the local American church into partnership with the indigenous “international” church. These partnerships enable the sharing of resources to provide hope for orphaned and abandoned children though the Church. As we expand our team of advocacy volunteers, we hope to raise orphan awareness and, help people get involved to further the partnerships and ministry of World Orphans. Tammy first contacted me by phone. She and some friends from church had been meeting to pray for orphans and for wisdom on how they might become involved. After a phone conversation, we sent Tammy some materials and information about World Orphans, and she shared them with her friends. They agreed to form a team. Then Tammy approached a leader in her church and shared her heart for orphans. She was given permission to explore how her church might become involved. After seven months of more prayer, more emails, and more phone conversations, Tammy recently submitted a partnership proposal to her church asking for a five to seven year partnership with an indigenous church where a World Orphan’s family-style home is being built. Tammy and her team are planning the mobilization of their church into orphan care. They understand that their church will be strengthened as the body engages in care for orphans; that the indigenous church they partner with will be encouraged and sustained through their provision; and that twenty or more children will be rescued from the street. We are grateful for Tammy and her team. Her leadership as an advocate is a great example for all of us--a story of faithful work and prayer on behalf of the least of the least. This is one of the first of what we hope will be many connections made through World Orphans advocates just like Tammy. We are seeking and desiring to assist individuals, groups, churches, teams, businesses…people like you and your friends…to get connected, to become part of the solution, to care and cause others to care about the abandoned, orphaned, and forgotten children of our world. So what can you do? Can you make a difference? Let’s explore these questions together. 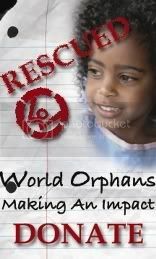 Please e-mail me at alanh@worldorphans.org. I look forward to hearing from you.